Viola and Piano with a CD of Performance and Play-Along Tracks. Composed by Kurt Weill (1900-1950). Arranged by Martin Reiter. Sheet music with CD. String Solo. Standards. Softcover with CD. 53 pages. Universal Edition #UE34325. Published by Universal Edition (HL.49019700). ISBN 3702471154. 9x12 inches. Book/CD Pack. 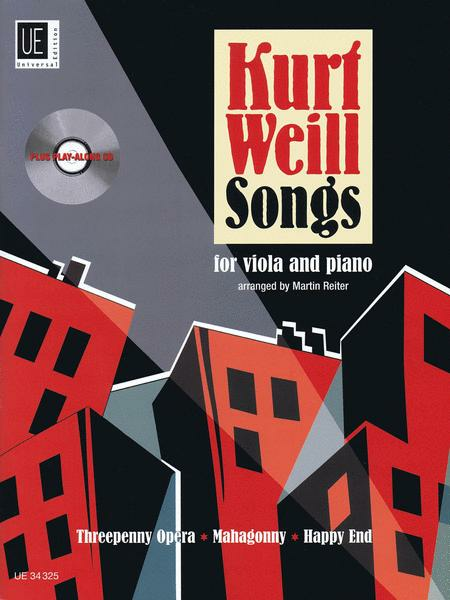 10 songs from three of Kurt Weill's most famous stage works are presented in easy arrangements for viola and piano. The CD provides invaluable listening material and an alternative accompaniment in the absence of a pianist.